The issue of immigration is once again receiving a huge amount of media coverage, and sadly, but perhaps unsurprisingly, large proportions of the coverage is negative, sensationalist and wildly inaccurate. Sky News have commissioned a weekly long programme of coverage entitle Immigration UK; featuring special reports and a number of opinion polls. These surveys have lead to the development of headlines including Britons want ‘Drastic Action’ on Immigration and Brit Workers ‘Against the World’ thanks to loaded questions from the broadcaster and the use of a very small sample of responders. Working with over 50,000 young people every year, we witness first hand the damaging effect of over-dramatic and poorly researched media stories on young people (and adults) understanding of the impacts of immigration. Young people regularly tell us that they don’t know the difference between an immigrant, an illegal immigrant and an asylum seeker, but say with confidence when questioned that they are all ‘bad people’. Eight year olds tell us that ‘immigrants steal jobs’ and state as fact that ‘more than 50% of the people in the country are not British born’. In today’s multimedia dominated culture, the media plays a bigger role in the development of these stereotypes and negative perceptions than ever before. A recent study of the period between 2010 and 2012 by the Immigration Observatory found that the most common word used to describe immigrants by the media is ‘illegal’, and whilst it can be argued that many young people don’t spend a huge amount of their time watching news programmes or regularly reading newspapers, these messages are filtering through to a younger audience. 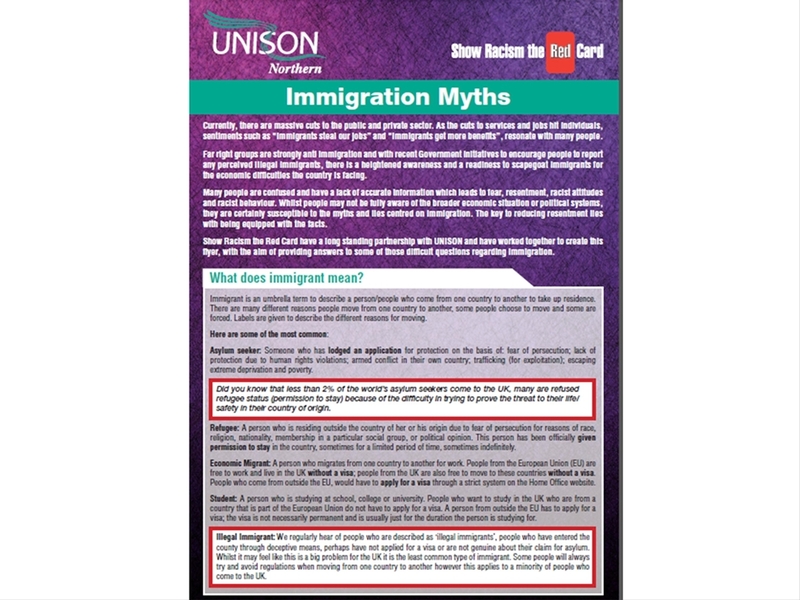 In order to combat the effect of this media-supported stereotypes, Show Racism the Red Card has teamed up with UNISON to develop an immigration myth buster which challenges some of the most commonly held misconceptions about immigration and attempts to present the facts behind a range of statement and provide a more balanced picture of the impact of immigration on Britain. For example, the subject of whether immigrants are able to jump the social housing queue is addressed and evidence is provided that over 90% of those in social housing are UK born – a statement which is vastly different from the ‘reality’ presented to us by large numbers of young people, many of whom believe immigrants are given a free house on arrival in the UK. It is incredibly important that young people are encouraged to think critically about the information they receive from the media, particularly regarding immigration, in order that they can form an evidenced-based opinion about the impacts of the phenomenon and be relieved of the burden of prejudice. With immigration looking like becoming an increasingly important issue in the result of the forthcoming general elections, a clearer understanding of the issue is now more important than ever.